How well do you know London Underground Tube Seats? Three parts to this Friday's quiz. 1. Rather than naming all twelve please just name TWO of the lines that the seat upholstery comes or came from. Any smart alecs "Saying, Miss, Miss, I know all of them" and naming all twelve, or more than two, will have to stand in the corner and find their answers mysteriously evaporate. There is however, a bonus point if you don't give the same answer as the person immediately before you. 2. 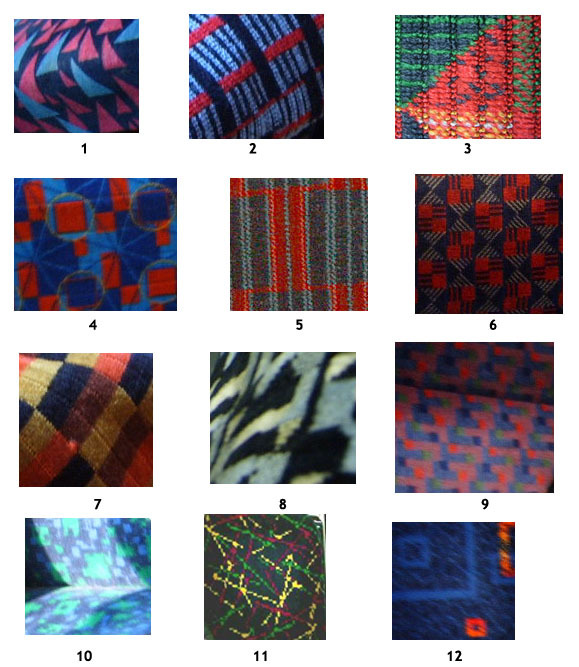 Name one of the very first people who designed some moquette for London Transport. Again, you get a bonus point if you don't give the same answer as the person just before you. 3. Moquettes don't appear to have names, which is rather sad. So please come up with your own unique name for one of the moquettes pictured above. It will help if there's some connection to either the line or the pattern, so no points will be given for names like Bert or Fred or Jim. The more inventive the better! As usual the people who get most answers correct will go into Neil's paperclip selection. To enter leave your email address and/or blog/website with your answers in the comments below. Please leave all your answers in one entry and you can only enter once! You have until 23.59 GMT, Sunday 9th July to make your guesses. 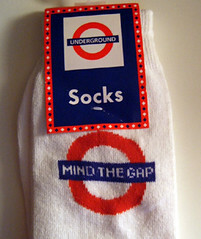 And the prize, a lovely pair of Mind The Gap socks, so if you think of putting your feet on the seats on the Tube (heaven forbid), you can display your sockwear with pride. Here's this Friday's look at our slaves to fashion on the Tube or people with their own noticeable look when it comes to clothes. There's a bit of a lurve thing going on this week with people wearing T-Shirts inviting some personal attention. Still anything's better than football shirts at the moment. Fortunately she was just leaning against the pole rather than doing a dance around it. In any case he didn't have "Or Hug me Slowly" on his back. I wish I'd been able to take a proper picture of him though, as he had the most amazing, just got out of bed, back combed, Shockwaves, hair style. The picture also doesn't show his purple star "Christmas Cracker" bangle very well. How many more varieties of tattered jeans are there? 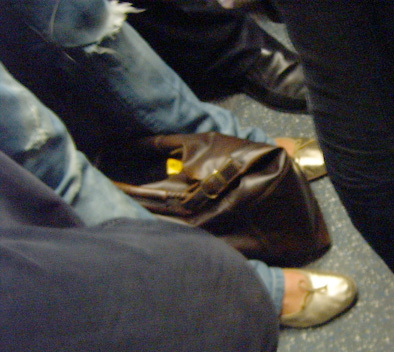 Although you can't see it in the picture very well, she had her travelcard in this back pocket, so I just hope the pocket doesn't wear even more, otherwise she'll be in for a bit of shock at the barrier. 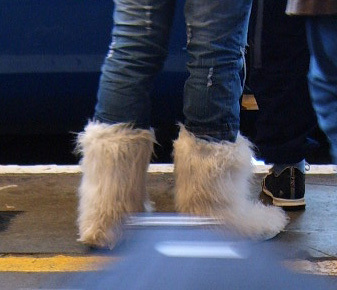 I know that we've hardly been having a heatwave in London, but is there any need to wear these Womble/Yeti Ugg boots in late June? In fact let's scrub late June from my last sentance, is there any need to wear them at all? I often see a lot of blog entries from people where they count things in a sort of Bridget Jones Diary type of way. You know the score - number of cigarettes smoked today 12, number of crisps eaten 18, number of pounds lost 1, etc. I can't say I've ever been particularly interested in counting things since I have been at school. However someone sent me a link to an interesting "watchers" project where a number of things in south east London have been counted, with pictures taken to represent them. A station assistant at Bermondsey London Underground Station must have been fairly bored and he counted the number of people hurrying through the station in one day. It was only 41. Which really doesn't seem a lot to me, but I suppose as it's not in an interchange, or maybe no one is in a particular rush for anything at Bermondsey. However as I have no idea how many people in total pass through Bermondsey Tube I'd never really know if 41 is a lot. If there's anything else you'd like to count or make a suggestion for people to count, feel free and leave in the comments below. Thanks muchly. Wembley, Wembley Quite Contrary. How does your garden grow? No I haven't gone entirely mad, but summer's here and that means it's time for that special date in London Underground's calendar. It's not the announcement of this year's "Staying cool on the Tube campaign" or Sheriff Ken's prize for inventing air conditioning on the Tube. But the London Underground Annual Station Gardens competition is underway. Hoorah, hoorah, hoorah. I know that many of you who travel on the Tube will think that a "station garden" is a platform that's been cleared of all the tin cans, crisp packets and pigeon droppings. You might be forgiven for thinking that a garden is some moss that's grown up between the cracks in the platform or some weeds or buddleia trees that have been allowed to take over the sidings. But no, there are 33 entrants in this year's LU Station Garden competition which is double the amount from last year. Southfields is one of the stations that has entered, and it came 2nd in the Cultivated Garden section last year. The competition is to reward "employees who go beyond the call of duty and spend much of their free time creating a pleasant and colourful environment for their colleagues and the travelling public to enjoy by planting and keeping Underground station gardens." 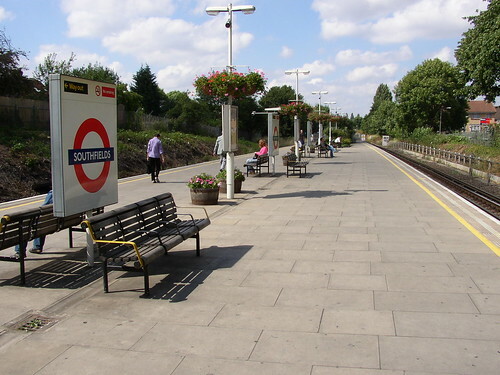 Although Southfields is nothing like a garden compared to the winner from Pinner in 1966, which was so resplandant with its 3,000 plants and flowers you can hardly read the station's name. 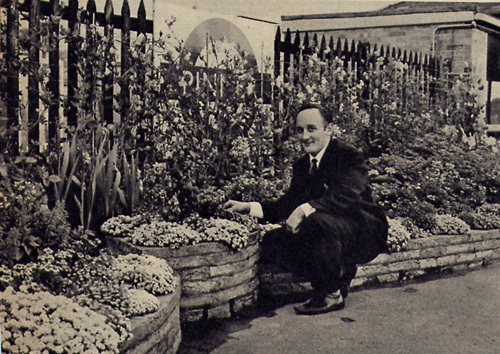 Pinner is sadly no longer in the running and a number of other prize winning station gardens from 1966 seem to have fallen by the wayside too including Kilburn, Hammersmith (did it ever have a garden? 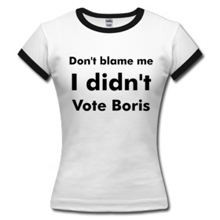 ), Moorgate, Barons Court, Finchley Central and Snaresbrook. But hats off to the following stations whose station gardeners upkeep the gardens in their own free time and only receive an allowance to buy seeds and plants: Baker Street, Bank, Bermondsey, Canons Park, Chesham, Cockfosters, East Acton, Earl's Court, Elm Park, Epping, Farringdon, High Street Kensington, Highbury & Islington, Leytonstone, Loughton, Notting Hill Gate, North Acton, Northolt, Northwood Hills (last year's winner), Queensbury, Rotherhithe, Shepherd's Bush, South Kensington, Rickmansworth, Ruislip Gardens, Southfields, Stanmore, Stratford Market Depot, Surrey Quays, Watford, Wembley Park, West Ruislip and White City. Most of them, as you might expect, are in the more suburban outer zones of London. But it's good to see Baker Street, Earl's Court, Shepherd's Bush (although the mind boggles with Shepherd's Bush - maybe they've had an influx of containers since I was last there), Bank and High Street Kensington. It goes to show that it's not just the "leafy" suburbs that have keen station gardeners. Do you have a station that you think should have entered for its horticultural displays? Or is your regular home or work station amongst this year's entrants? Or do you think there's a forgotten station somewhere that could benefit from some Ground Force treatment? Gunnersbury would be my favourite as it looks more and more like the hideous concrete carpark that surrounds it and is in desparate need of something to brighten it up. 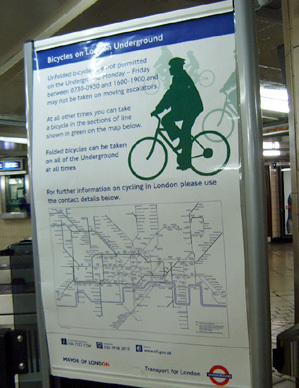 Someone emailed me to ask whether you could take bicycles on the London Underground. I knew that there were some stations where you could and some where you couldn't, but I didn't realise that this also depended on the the time of day. So I looked at the cycle map and also the list of lines with the restrictions and I was puzzled by a number of things and wondered if you could enlighten me. Not being allowed to take a bike at all on the Waterloo & City Line makes sense, (not that anyone can do much on the Waterloo & City Line at the moment anyway), but why no bikes at all on the DLR? I'm positive that I have seen people with bikes on it, so is that only a fairly recent rule? The Victoria Line is entirely underground, so I imagine that might be the reason why you can't take bikes on it, but how come you can use bikes on the sub surface section that of the District Line? Is it anything to do with the depth of the stations there? Is the rule of not carrying bikes in peak hours due to the amount of space they take up or for some other reason? If it's a space issue, why then are people allowed to carry enormous suitcases the size of small camper vans? Or large rucksacks? Particularly the people who seem to forget they have a rucksack on their back and insist on pirouetting through the carriage, knocking over people who unfortunate enough to be standing behind them. 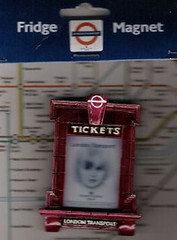 Thanks to the people who entered the scavenger hunt to search for Tube related items on the internet. Inventiveness prizes go to Jon Justice particularly for his pre 1910 Tube poster, Fimb for taking a picture of smiling Tube staff (in the pub! ), plus I decided to give Wilson in Toronto a prize for being first. 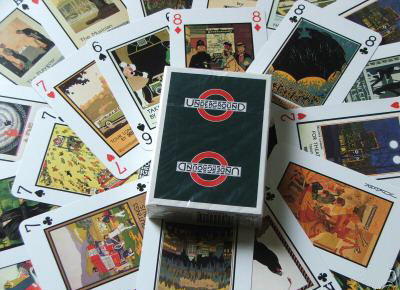 You all did very well with points for giving different answers to the person before you, but the overall winner is Chz who wins the London Underground Playing Cards. Well done to all who entered and you've still got a few more days to guess the locations where the Ian Brown video was filmed! Is it possible to have a day on the Tube at the moment without a whole line or part of a line being suspended? The entire line is out due to signal failure in the White City area. Good luck if you're trying to travel on the Central Line this morning as you'll have problems. Check out the Real Time Delays section on the Tube's site for more info. About 150 passengers were led through a Northern Line train this morning due a faulty track at Waterloo. The line is now suspended between Kennington and Charing Cross and you can expect delays to the rest of the serivce this morning too. I wonder how this will add or aid its reliability targets? Although Tube Lines who run the Misery Line said that they hit their targets for the first quarter of this year despite recording delays on every single day. "LU targets are set according customer hours lost, so a train delayed at Bank station at rush hour will weigh more heavily on Tube Lines' figures than a late night train to High Barnet," said Thisislocallondon. So delays appear to be relative. Although, Tube Lines trumpeting about their reliability does lead one to think that delays are seen as a reliable part of the Northern Line service. Perhaps if you didn't get delayed on the Northern Line you might be worried that something was actually wrong with the line. "Thank you Turnham Green you've been a wonderful audience"
If you've been "lucky" enough to travel regularly on the District Line, I would be surprised if you had not come across the infamous "If you can't have a shave in the toilet, where can you have a shave" buskers. They've been doing the rounds on the District Line, since the early 80's but in all of that time, they only seem to have two songs in their reportoire. The first is the aforementioned shaving song, which is a protest song, lamenting the times when they used to shave in public toilets (mainly in the one that used to be in the underpass at Hammersmith Broadway). But they were always asked to move on, when all they wanted to do was keep themselves "clean and respectabull". The second is their classic "This train is going to Richmond, this train. This train is stopping at Earl's Court, this train. This train is going to Richmond, change at Gunnersbury for the North London Line. This train is going to Richmond, this train". Alternatively if you catch them going into town you'll catch the B side "This train is going to Barking, this train, etc etc". I finally managed to make a recording of the Toilet Song, which apparently isn't available in the shops, or on the internet (let's hope they don't read this blog). They were playing to a fairly relaxed carriage on Friday night and it was the first time, I'd ever heard them get a round of applause. They did very well in this carriage with a fair number of coins (but not "cheques, luncheon vouchers or Indian rupees" which they also accept) going into their omelette collecting pan. They even managed to sell a copy of the Toilet Song CD for four quid. So if you've never heard them before click on this link and enjoy! You'll never see them on the official Carling Busker circuit, as I imagine a two song repertoire wouldn't be enough to get them through the London Underground auditions or "Busking Idol". However, I wouldn't have thought they were too sad about it. I've never heard of any Tube ones that have been "discovered" or made it big, but a number of them apparently get paid by record companies to "demo" or play certain tracks, as it's cheap way of getting songs heard by millions of commuters. 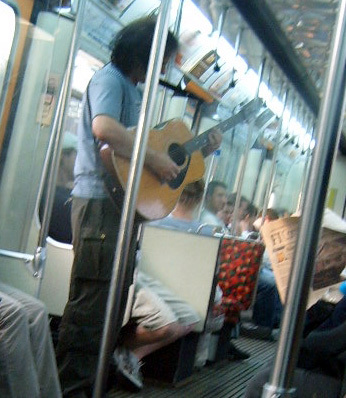 Do you have a favourite busker on the Tube? 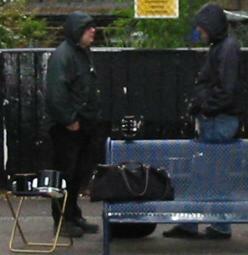 Or have you ever bought one of the CD's that a number of buskers are producing now? 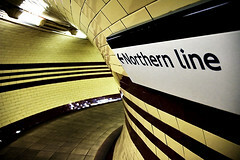 How well do you know the Northern Line? 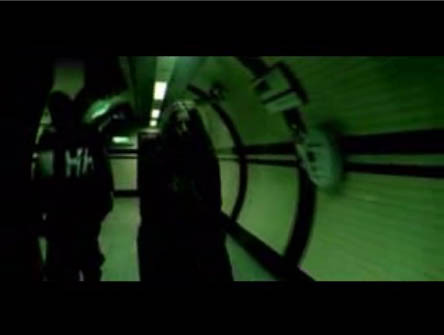 We've done a number of these quizzes in the past, where you have to see if you can guess where on the London Underground a particular music video was filmed (Madonna and The Scissor Sisters in the past). 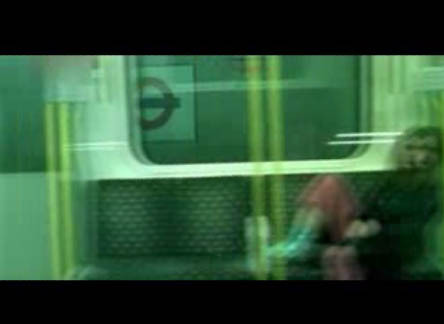 Thanks to Pedro Gomes who sent me a whole collection of online videos he's found related to the Tube and amongst them was a Creep style music video with vocals by Ian Brown, that's clearly shot on the Northern Line. But where? 1. Which station is this? 2. Which station is she sitting at? She sees a pretty spooky looking person at the far end of the platform, but not paying too much attention she gets onto her train and leaves. Now you know what continuity can be like on these videos and artistic license is often used with gay abandon. 3. 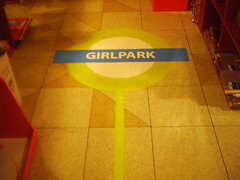 Is she leaving the same station as the one in the picture two? If not what station is it? 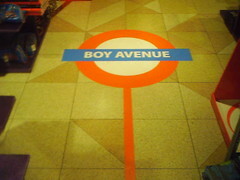 So one for the tube geeks, sorry ... experts, here. 4. Give me the name of the type of train that she's on. The more exact the better in terms of the stock. She attempts to get off the Tube at some point but the doors don't open long enough for her to leave. So she sits back down, appears to doze off and the mysterious character that she saw earlier comes over and touches her cheek. 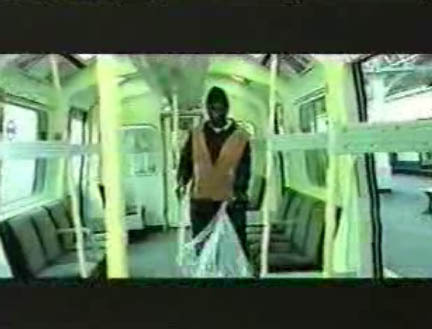 The video ends the following morning, with a station cleaner coming onto the train to clear the rubbish. He finds her apparently asleep and goes over to wake her but she's turned into a withered old lady and we can only assume that the mysterious character has stolen her youth & beauty. 5. What station does the cleaner find her in? It will probably help you in the quiz if you can find the video itself, but try not to give the link away to others when you answer! As usual the people who get most answers correct will go into Neil's paperclip selection. To enter leave your email address and/or blog/website with your answers in the comments below. Please leave all your answers in one entry and you can only enter once! You have until 23.59 GMT, Sunday 2nd July to make your guesses. 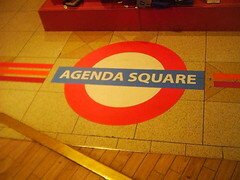 And the prize, well it's the nearest I have to something that's Tube and film related. 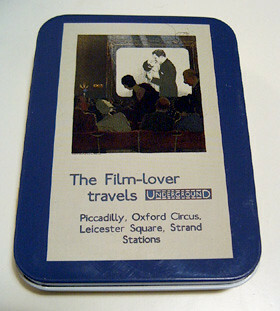 It's a handy little tin featuring a 1930's "Film Lover" London Underground poster. Use it to carry small knick knacks (whatever they are). What happens when you get some international architects and ask them to give a vision of what London might look like? 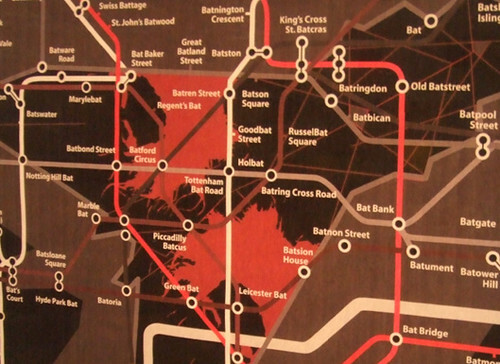 You get a Tube Map where the names of the stations all have the word "bat" in them! Many thanks to Matt from Londonist for sending me a picture of the architect's vision for London which is part of "The World in One City - Sketches of London" free exhibition that's currently on at The Gallery in York Way, Kings's Cross. It's on until Sunday 25th June if you'd like to see which country & group of architects produced this and quite why it's a vision of London's future. But in the meantime if you'd like to make a guess... feel free to do so in the comments below! Not so sure about carrying some fishing rods on your back with this outfit though! Even Twiggy on the poster opposite seems to find that a bit funny. Now we see a much more interesting & unconventional approach with the "hat"
She's also gone for the "I don't care if it's too cold to wear this dress, and I'm not going to cover myself up" approach. It's not called Glamoursmith for nothing. 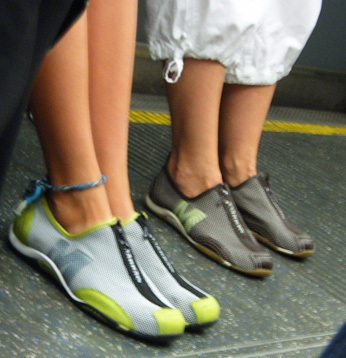 It's a very sporty look and I spose trainers like this are one of the most practical things to wear on the Tube, but they do make you look as though you're taking part in a triathlon. 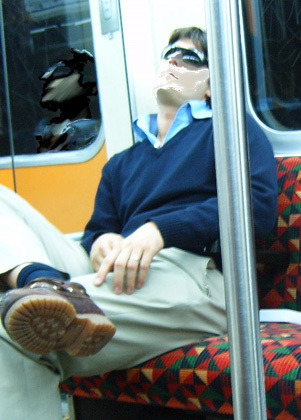 He's also doing the classic victim thing of keeping his sunglasses on inside the Tube. Blingy bangles, tick. Blingy rings with little chains hanging off them, tick. 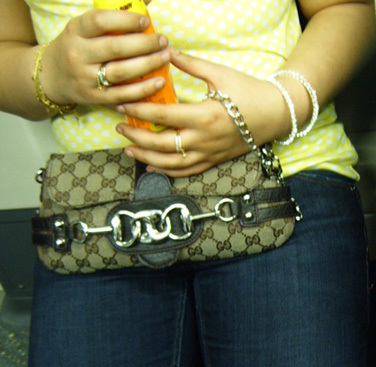 Designer "Gucci" bag with extra bling, tick. And finally, can you ever wear too much Leopard Skin? 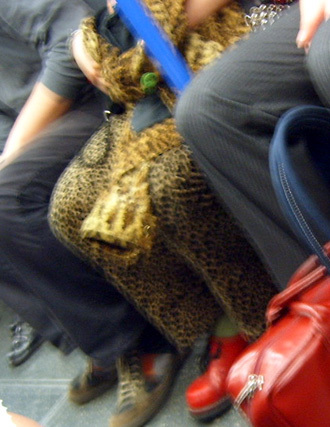 Leopard skin trousers & a leopard skin jacket. She looked a bit like the offspring of Pat Butcher out of EastEnders and Bet Lynch out of Corrie. 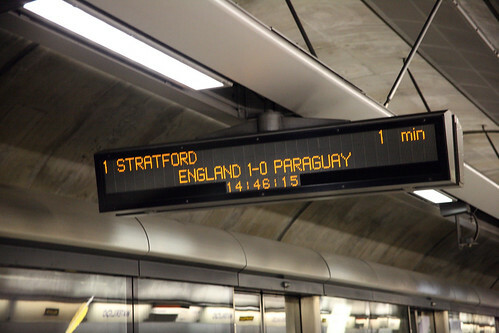 Yesterday I was wondering how the Tube Staff got to keep tabs on the World Cup. Some of them have radio coverage as TVs aren't allowed, but looks like some staff are keen on keeping the whole platform informed. Martin spotted this brill picture in Flickr by taken by Bruno Girin. 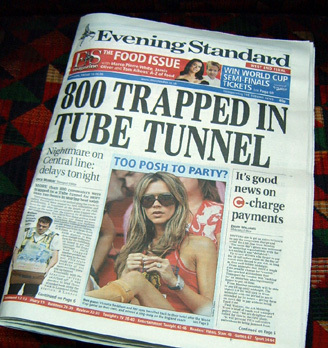 Bruno said "What if you are stuck in the tube rather than in the pub watching the game? No worries, the station staff will make sure the important information is displayed!" 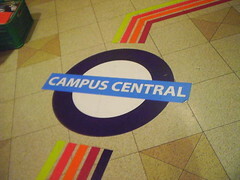 Many thanks to Rafael, Dmitri and Barry who sent in some more pictures of the London Underground roundel doing the rounds. 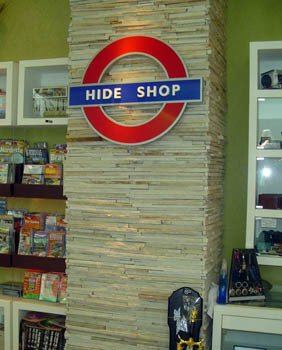 From Amsterdam to Brazil and Rafael sent me a picture of "The Hide Shop" which is a newstand in the city centre of Curitiba. And indeed as acb had mentioned in the comments, there is a trendy bar (Kaffibarinn) in Reyakjavik which is partly owned by Damon Albarn out of Blur and the Gorillaz. 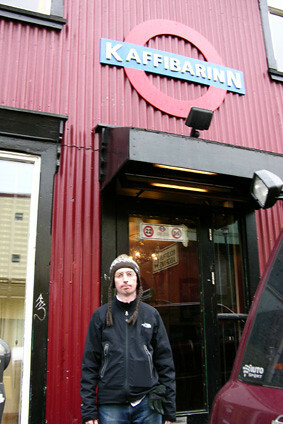 Here's Barry outside that very bar which is also kitted out with the Tube Roundel. Ever since reading 101 Reykjavik a fab novel about the crazy nightlife there, I've been keen to visit Iceland's capital. 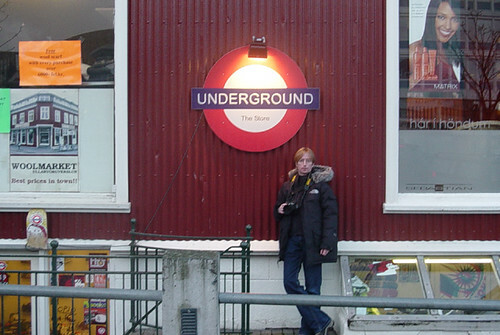 Barry said "It's quite surreal experience to travel to the Arctic Circle and find all these LU roundels all over the place, but then Reykjavik (and Iceland as a country) itself is quite a surreal place. A drunken Friday night staggering through downtown Reykjavik is something everyone should experience at least once in their lives!" Keep sending the pictures in and I'll blog them in due course, plus there's a growing Flickr set of the ones sent in so far. Cheers! I quite like his new Mohican haircut, but I didn't know that gold was one of the colours on England's strip. Ah but look, here is again although he seems to have got a bit darker and dyed his hair again. If I were Sven I would tell him to stop messing about on the Tube and experimenting with different hairstyles and concentrate on the game. It's not really that difficult is it? 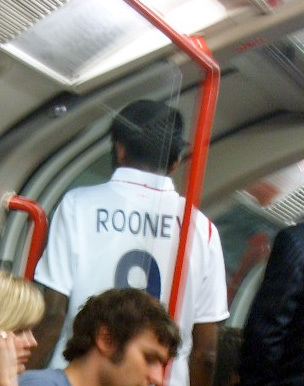 Later I was on the Tube during the match itself, and it's a great way of travelling. It's almost deserted. Plus when I went through Chancery Lane station concorse the station staff had kindly decided to "tannoy" the game through the loud speakers so the few passengers travelling through could catch the latest. One of my work colleagues actually wondered whether much of the Tube would be working as he imagined that a number of staff might throw a sickie! Surely not, I replied, They wouldn't do that would they? At my company we're lucky in that we can legitimately take time off to watch matches where "our own country" is playing. It's an international company, although the majority of staff in our London office are probably English, so people are deciding whether they can dredge up some long lost relative from Brazil or Argentina. However, I imagine Tube staff don't have this luxury and have to find other ways of keeping track of the games, when they're supposed to be working. Does your company give you time off to watch football, or do you have other "tactics" to keep informed during daytime matches? If you work on the Tube or railways I'd particularly love to know how you manage. Where do Tube Font designers go for inspiration? I'm not quite sure what the attractions of a small English village on the edge of the South Downs are, but it seems to be an inspirational source for some of Britain's most influential font designers, including Edward Johnston (he of the Johnston Tube Font) and Eric Gill (his pupil, who invented Gill Sans). Crikey, wouldn't it be cool to have a font named after you? In 1907 Eric Gill began a sort of artisans' community on Ditchling Common, where he could live out his ideas of self-sufficiency, asceticism and Catholicism, and also continue to explore his passions for typography, engraving and err... sexual shenanigans. "According to the 1989 biography by Fiona MacCarthy, Gill's relationships included two of his sisters and two of his daughters. His personal diaries also describe, in great detail, regular sexual activity between himself and the family dog." (I love Wikipedia). Lots of his friends came to join him in Ditchling (hopefully not in his sexual practices). These designers and artists included his former teacher, the idiosyncratic Edward Johnston, who created the Tube's iconic font and the world famous London Underground roundel. 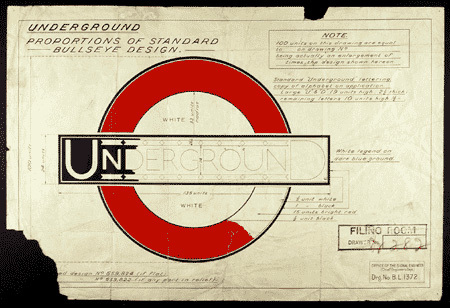 Johnston reworked the Underground logo with his new typeface and incorporated it with a red ring. Thanks to Marc, I learnt that The Ditchling Museum - a former Victorian schoolhouse - is putting on an intimate and revealing exhibition dedicated to Johnston's work. "The show will also celebrate the range of creativity that Johnston was capable of - both the public (it is extraordinary to think the designs for the radical new transport system of the time, The Tube, were designed in his studio in this rural village) and the personal (books for his children)." Johnston was also a calligraphy expert and his 1906 book Writing, Illuminating & Lettering is considered a calligraphy Bible. So it's fitting that 100 years later an exhibition is staged in his countryside haven and hideaway. Perhaps you need to escape from the city in order to get a bit of perspective on it and design a font and icon that cuts through the clutter. The clarity of the typeface made it a perfect information tool, and it's been used on posters, signage, the Tube Map and publicity since its creation in 1913. The Johnston typeface was redesigned in 1979 by Eiichi Kono at Banks & Miles to produce New Johnston, which is the variant currently used by Transport for London. With Pen Ink & Paper: Being Edward Johnston runs until the 1st October at the Ditchling Museum, Church Lane, Ditchling, Sussex, and is £3.50 for adults, a quid for students and children go free. On Friday morning around 800 passengers were stuck on a Central Line train after it broke down during rush hour. At 8.50am a train broke down between Liverpool St and Bank stations and it took until 10.45 for the last commuters to get out. The broken train was close enough to to the platform for hundreds on board to get out, but it trapped another packed service behind it, which could not reverse because of the other trains queuing up behind. One person on board had the following story, when he explained how passengers left in groups of ten. 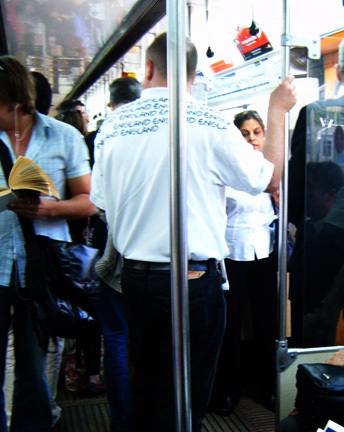 "After an hour the driver told us the first two carriages had been emptied. I was at the very back and I started thinking I could be there for hours. One lady was suffering very badly. I can't believe they would keep someone like her trapped down there for almost an hour. "It took an hour to get everyone on the front of the train off then just half an hour to get the rest of us. They obviously abandoned doing ten people at a time because it was too slow." LU were trying to find out what caused the break down, but a British Transport Police spokesman said: "An object had fallen off the train and the train was stuck. It may have damaged the track." So this is the second time in a month that passengers have been stuck underground for more than an hour. It must be a nightmare when at first you don't have a clue as to what's going on, and then wondering when you're actually going to get out. London Underground are really lucky that more people don't have panic attacks and fortunately on this occasion only one person required medical attention after fainting and 12 were treated for exhaustion and dehydration. "The Ticket Collector's" blog has an entry about what it was like on the train, and it's quite interesting to see how a member of surface rail staff felt being stuck underground and what he tried to do to help. Somehow your train fare back under the Customer Charter doesn't seem the right amount of compensation in times like this, and lets hope like with the people stuck on the Victoria Line, they get a better amount of compensation. Although I do wonder how you can possibly work out what the "right" amount of compensation is? Good response to the quiz where you had to guess the station names from the following cryptic clues. So have another go then. From the original post, no one offered an answer for 6, 8, 12, 14, 17 and 20. 6. Er, drench a porky. Confused? 19. It's well-liked without you! The answer given to 11 wasn't exactly what I was looking for and number 1 ended up having two correct answers. Plus the answer given for 16 wasn't correct! So have a go with as many as you can and Neil will do the paperclip selection amongst the original correct guessers later today. 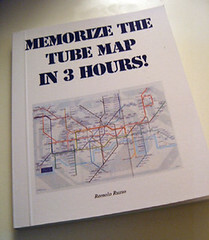 OK the paperclip selection has now taken place and the winner of "Memorise the Tube Map in 3 Hours" is Michelle. The runner up prize of a Tube Mouse Mat goes to Jamesthegill who was 2nd in the selection! So very well done to them. The answers are below - although after this second attempt I think they were all guessed correctly. However, if you'd like me or Neil to explain the answers, feel free to ask. Less painful on the brain is the scavenger hunt quiz below, so you might want to try your luck at that and the more liberties taken with PhotoShop the better! Fimb's Tube Scavenger hunt quiz in March was so popular, with some really inventive answers that I decided to do another one. 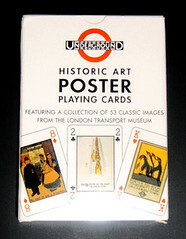 You get to win a brand new set of playing cards - each one features an image from a "classic" London Underground Poster. 1) A colourful Tube train - ie not one that is silver, or silver, red or blue. 6) A picture of a smiling London Underground member of staff - it can be a driver, station assistant, manager or someone else who works on the Tube. As my haloscan commenting system used to only let you put three links in each comment, you might have to make two comments if you want to enter (although Fimb seems to have all put at least six links in one comment). Plus each answer to number 6 MUST be different - so you can't give the same link as someone else. 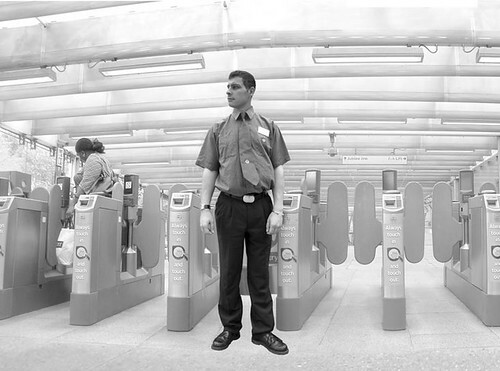 There must be hundreds of smiling Tube staff pictured on the internet so it should be easy to find them. Shouldn't it? You have until 23.59 GMT Sunday 25th June to make your guesses and please leave either your email address and/or blog or website in the comments when you make your two posts. As usual Neil's paperclip selection will come into play in the event of several people getting the same high point score. There may be some bonus prizes of fridge magnets and badges for people who give particularly inventive answers. Once again it's Friday's look at commuters who could be considered slaves to fashion or have a particularly unusual sense of "style" when it comes to clothes. 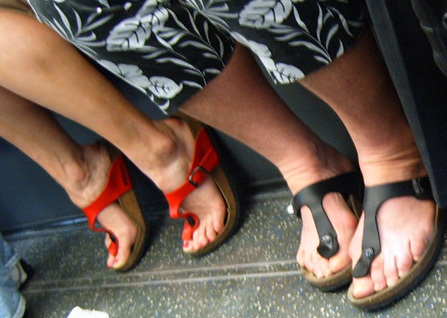 Apart from on Monday when it was roasting, the weather's been fairly normal for mid June, so lots of sandals but no women actually spotted wearing underwear as outerwear.....yet! Speaking of sandals, looks like Birkenstocks are once again this year's must have footwear. It was very kind of these women to wear contrasting pairs in red and black and sit opposite me. I think I must be one of the few people in the world who doesn't think Birkenstocks are comfortable. I can't wear those sandals that have a bit between your big toe anyway, but even the Birkenstocks without the toe bit I find extremely uncomfortable. I persevered with them one year for about a month and then gave up. However, thanks to doing this section of the blog I am now Converse convert. 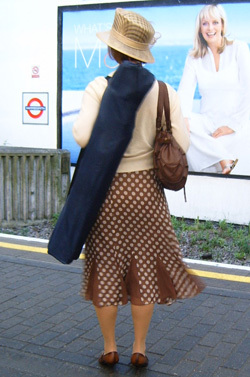 But even though I'm a new Converse convert, I don't think you should wear them with smart tweed skirts. Or should you? I know that David Tennant gets away with them with a suit in Dr Who, (geek chic) but I think they look pretty ugly with this rather school marmish skirt. Perhaps it's because they're not real Converses either but mock ones. If you didn't read the comments on a non fashion post in the week, you won't know that we've had the first victim to spot themselves on the blog. Lu spotted herself as the "victim below"
She said "That is 100% certainly me down in the fashion victims with the torn jeans. You can even see the bit I sowed back together on the left leg. Crikey." When I asked how she managed to get them looking so worn on the knees, she replied "Annie, The torn jean effect just happens to some of us, and to some of us it doesn't. I first knew it was me (not simply because of the matching shoes with the matching torn jeans) because of this inward facing way I turn my feet when I stand. 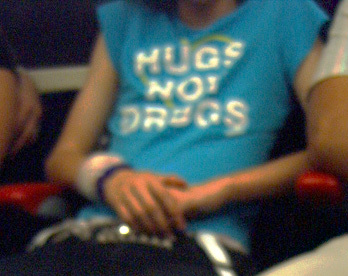 Plus it seems that I am leaning against the wall, which I do a lot on the tube. Is that at Hammersmith?" 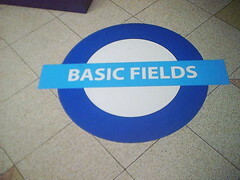 It was certainly on the way to Hammersmith on the Piccadilly Line. But I'm delighted that we have our first identified victim and fortunately she didn't feel like belting me one! However, I'm assuming that Lu isn't the lady who's also going for the tattered jeans look below, although there is a bit of a theme with metallic footwear! (First metallic flip flops I've seen this year). She seems to have gone for a much more "tailored" and deliberate torn look than Lu. She also appears to have some icicles or chains dangling off her wrist. So to finish with some men. 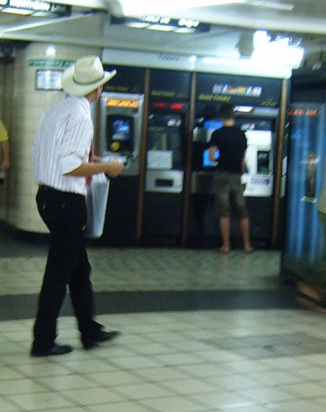 This bloke in a stetson reminded me of Shiloh Jolie-Pitt's grandad's character in Midnight Cowboy. He seemed to be looking fairly lost in the big city, and may have just landed from a little place way out West. Or maybe he's simply trying to ressurect the stetson look that was trendy a year or so ago. Taken yesterday morning, this bloke obviously wanted to support "our lads". 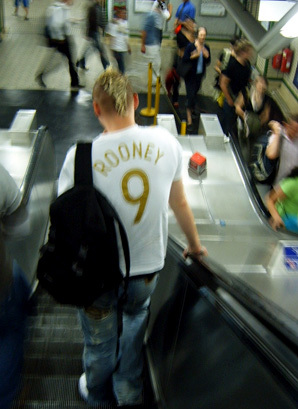 Unlike the bulk of men who seem to be going retro by sporting red football T shirts, he went for white with a chavtastic style of writing on the back. It almost reminded me of the writing on the back of "Off White Jacket man's" jacket. Am I missing a new Barefoot and Bandanna'd trend?